Want to learn more about the fight for women's voting rights but don't want to watch an entire movie? Watch John Green, best selling author of The Fault In Our Stars, give this smart and funny overview of the fight for women's rights in the Progressive era. Like what you see? Consider checking out some of the other videos in this series to learn more about American history! Watch this inspiring short film, created in a series for Vanity Fair magazine, showing one woman's decision to join in the fight for women's rights in America. Incorporated into the short film are pictures from the movement, adding realism to the story. 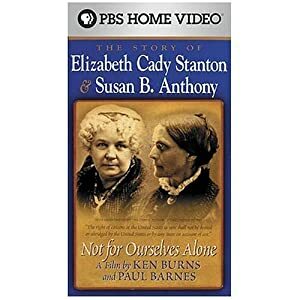 Presents the history of women's suffrage in the United States through the dramatic, often turbulent friendship of Elizabeth Cady Stanton and Susan Anthony. Part 1 covers the years from their youth up to the establishment of the National Woman Suffrage Association in 1868. Part 2 spans the period from 1868 to the passage in 1919 of the 19th amendment to the Constitution which gave women the vote. In this HBO produced film, Hilary Swank stars as Alice Paul and chronicles her work with Lucy Burns along with other important suffragists in the final fight to pass the 19th Amendment. The MSUB Library owns a copy of this movie. The call number is PN1997.I625 2004 and it can be found on the video shelf. Created for PBS, this documentary chronicles the 70 year stuggle for women's right to vote, leading up to the passage of the 19th Amendment in the U.S. Senate by one vote. The MSUB Library owns a copy of this movie. The call number is JK 1896.O54 2005 and it can be found on the video shelf.